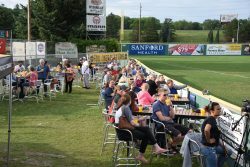 The North American Coal Club is the perfect place to “wow” clients, reward employees, host company picnics, or have a great time with family and friends while enjoying a Larks game. The best part? We do all the work. From the time you book your event to the final out, we take care of all the details. Setup. Clean up. And everything in between. Enjoy exclusive amenities such as a private food and beverage outlet equipped with group seating areas, games, and a premium ballpark food & beverage buffet. Not to mention you enjoy all of these amenities as close to the field as possible. 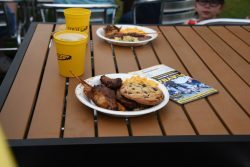 Located on the 3rd base side, the exclusive area will be equipped with food & beverage with plenty of room for socializing and taking in the ball game. 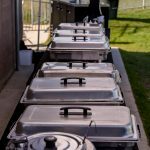 Receive a mouthwatering menu including items such as smoked brisket, pulled pork, wings, mac & cheese, potato salad, desserts & more. Enjoy Unlimited soda and water through 7 innings. Each guest receives 5 drink tickets to enjoy premium beer or wine. All beer and and wine beverages are served through the 7th inning. 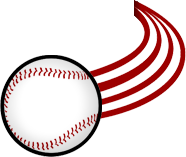 Kids 12 and under receive a free Larks hat, and a $10 YMCA Family Fun Zone wristband.